Tonia Mitchell, dollmaker extraordinaire, was the guest speaker at the October meeting of the Brown Sugar Stitchers in Atlanta. Tonia shared her artistic journey with the group and brought along some examples of her extraordinary work. Her presentation was very inspiring to all. Her work has been sold at Tiffanys and Neiman Marcus in Atlanta. 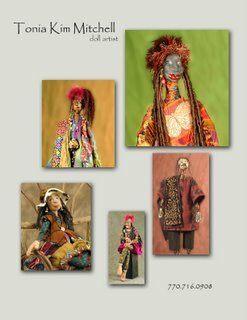 To see some examples of Tonia’s work, check out the book Black Dolls which can be purchased on Amazon.com.